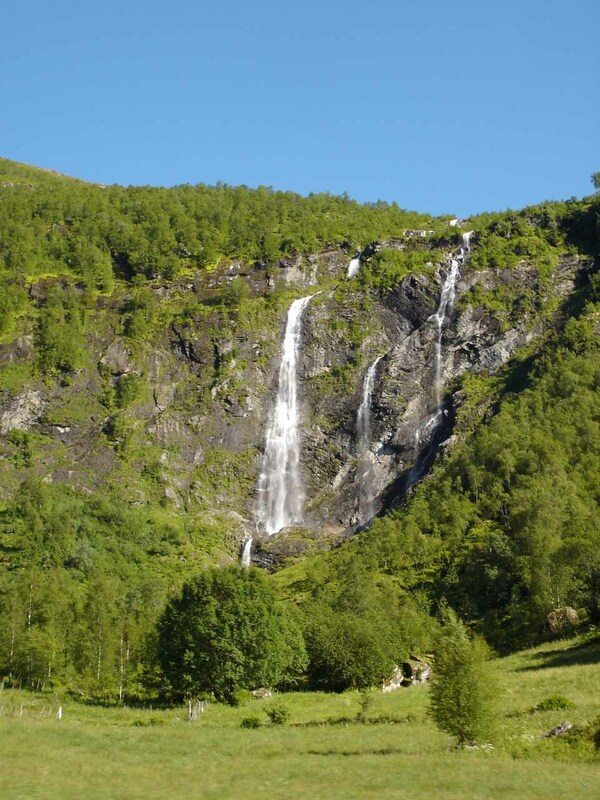 Eikjelandsfossen (I’ve also seen it spelled Eikelandsfossen) was merely one of many waterfalls that Julie and I saw while doing a loop drive that started and ended in the town of Førde but encompassed both the municipalities of Førde and Gaular in a region known as Waterfall Country or Fossheimen. We have a separate writeup for both Laukelandsfossen and Osfossen, which were also well-known waterfalls in this region. We missed out on the waterfalls Rekvikfossen, Alværfossen, Sandefossen, Sagiefossen, Fossfossen, and Haukefossen, which were all in between Osfossen and Eikjelandsfossen. 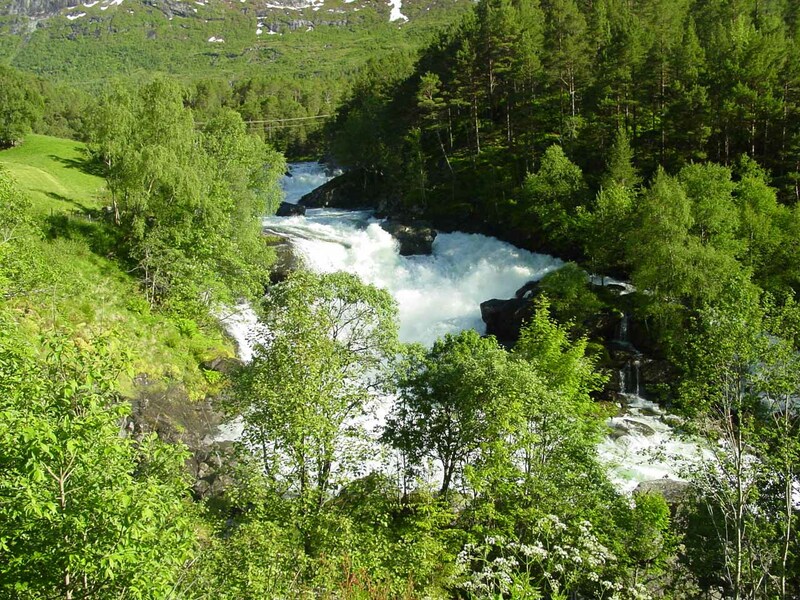 In any case, Eikjelandsfossen was probably the most powerful of the lot that we saw on this loop, but given the sheer quantity of waterfalls, I decided to clump this and many of the other waterfalls of Waterfall Country that we did encounter, including the Fossestein (Waterfall Path) into this one page. There was simply way too many waterfalls to single them out and dedicate pages to them one-by-one. 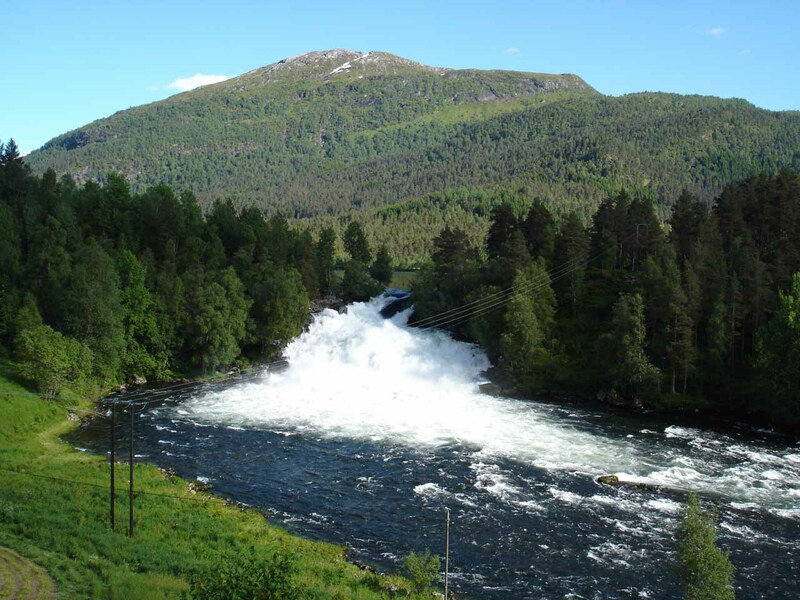 Starting with Eikjelandsfossen, we learned from a sign by its car park (see directions below) that it had a reported drop of 15m with a flow rate of about 75 cubic meters per second in the Summer. We followed a short descending trail for about 5- to 10 minutes until we ultimately arrived at the opposite end of the waterfall’s big plunge pool. Given the intense spray from the falls, the area around the plunge pool was a little on the muddy side. So we didn’t do much more exploring beyond the view you see at the top of this page. After Eikjelandsfossen, we then continued driving east along the southern shores of the lake Vikdalsvatnet (or just Viksvatnet). 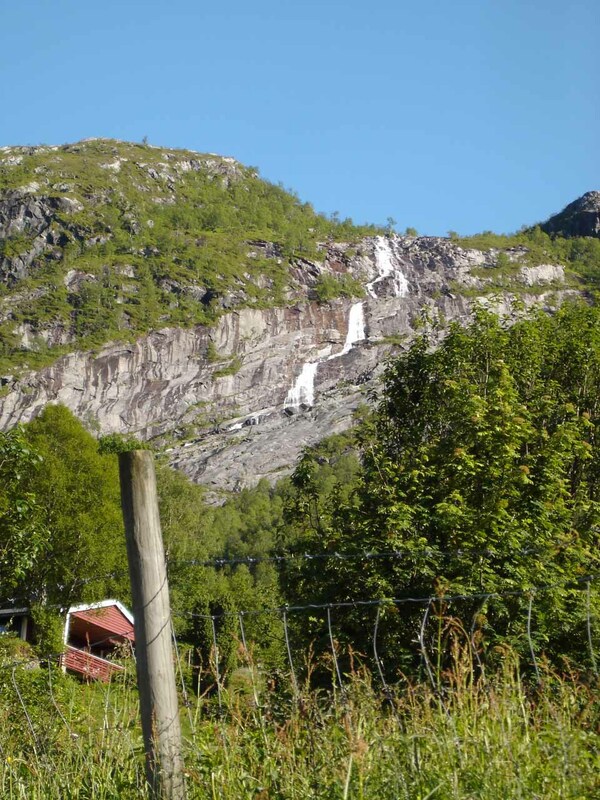 There were several more unnamed or miscellaneous waterfalls that Julie noticed and managed to photograph while I was busy concentrating on the road. Most of them were of the thinner, cliff-diving variety, but there were a couple rapids or cascades that were on the Gaula Watercourse itself. 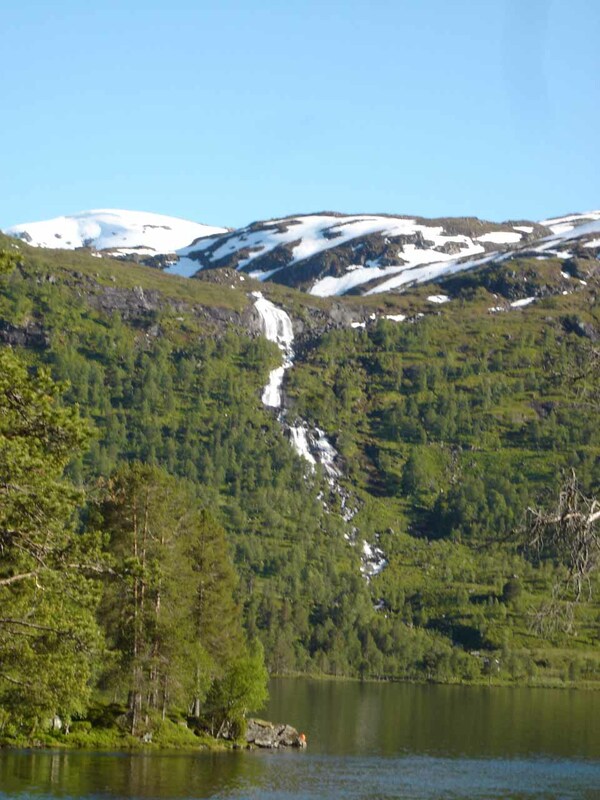 At the headwaters of Vikdalsvatnet (where there was the Vikafossen), we then took another detour on the road 13 up alongside the river Eldalselva. 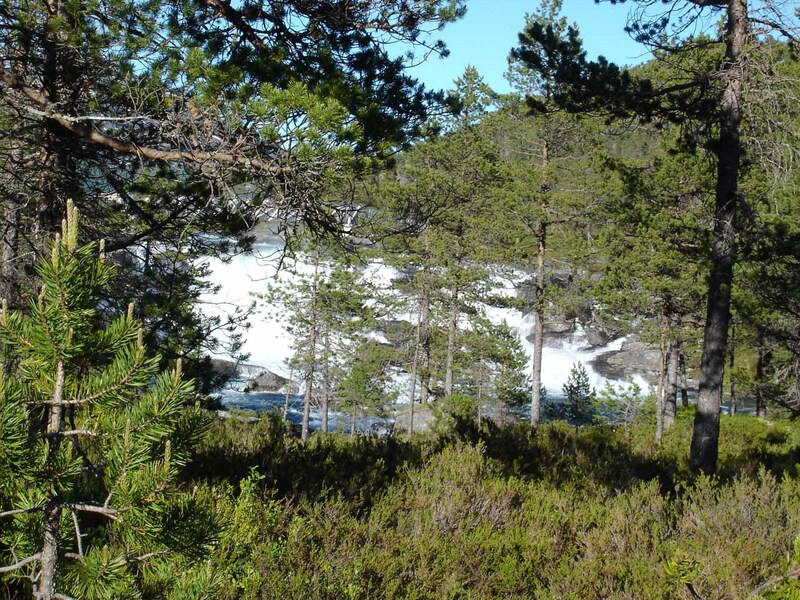 It turned out that this detour was along the famed Fossestein trail, which was a 23km long hiking trail that followed the Eldalselva with several named waterfalls along the way. 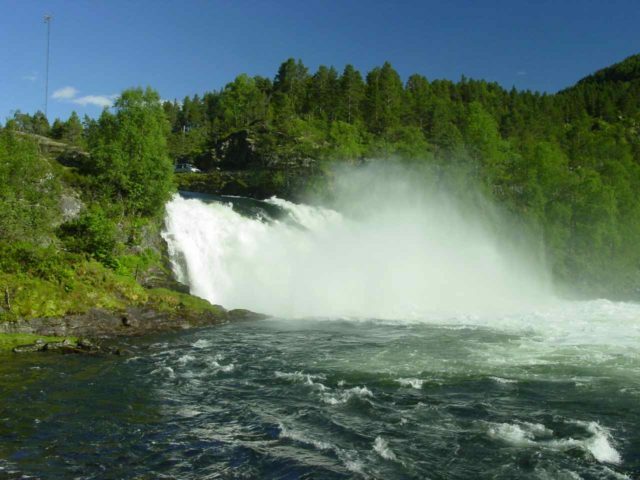 According to a sign that we saw earlier on by Eikjelandsfossen, the Fossestein Waterfalls were named Osefossen, Bellsfossen, Kleivafossen, Lisjefossen, Strufossen, Lyngstadfossen, Gjermundstadfossen, Hovfossen, Likholefossen, Mjellsfossen, Longestølsfossen, and Kviteførkle. 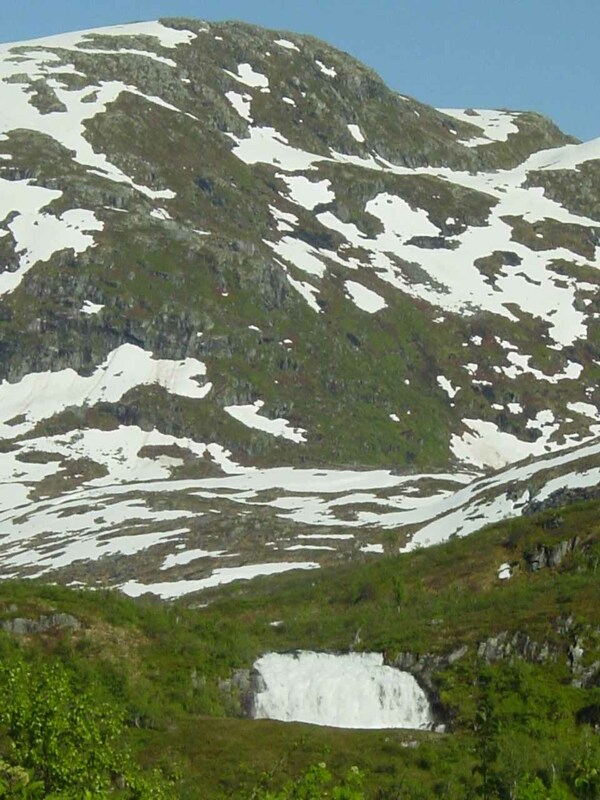 As we were driving on the road 13, we could get partial views of fleeting views of some of the named waterfalls. However, it seemed like the Fossestein Waterfalls were really to be experienced by foot as there weren’t any (or at least none that we could find) places to pull over and try to visit these waterfalls in an autotour. A large majority of the falls we happened to notice along Fossestein were more like rapids or cascades, and I didn’t recall seeing any of the more dramatic plunge types of any size. 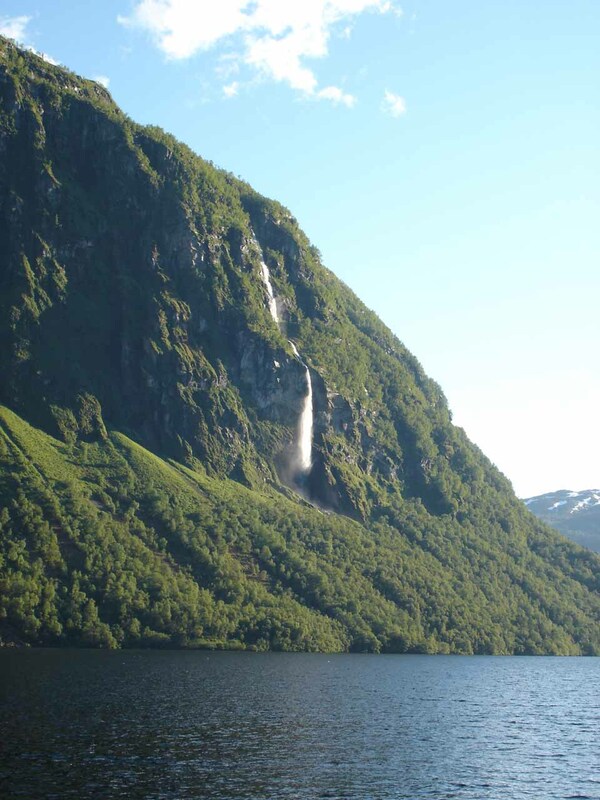 In any case, given the sheer quantity and inability to quickly visit each of the falls without turning it into a full-day one-way shuttle hike of 23km, there was no way we had a prayer of identifying or at least associating our waterfall photos with their formal waterfall names. When we were through with our out-and-back detour of the Fossestein, we then continued with our counterclockwise Førde/Gaular Loop and encountered the signposted Vallestadfossen shortly before reaching the lake Haukedalsvatnet. 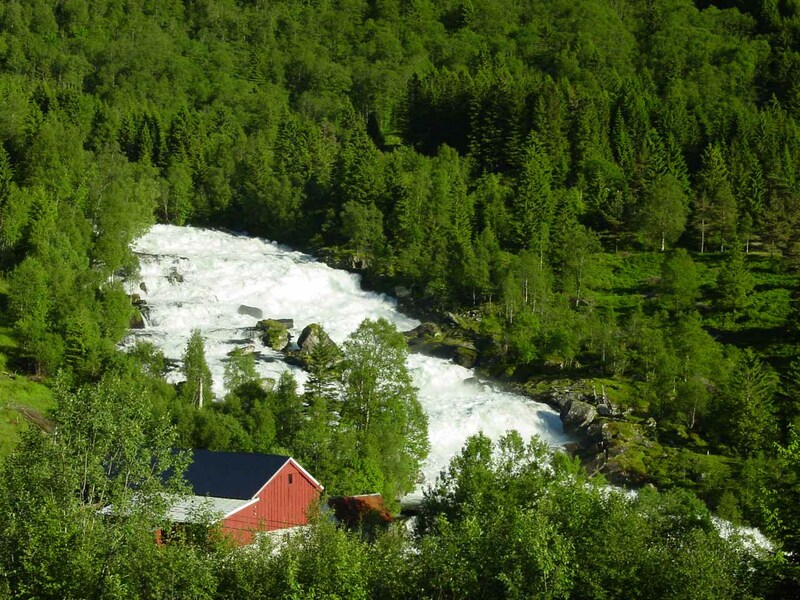 There was a picnic table as well as a view of the sliding cascade fronted by a red farm providing contrast with the white of the water and the green of the forest surrounding the area. 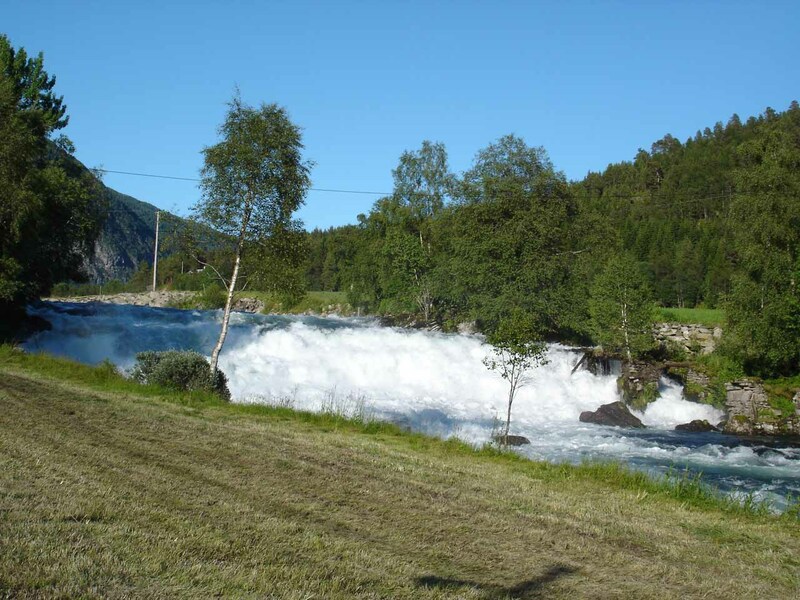 Vallestadfossen was really a long, sloping series of rapids as opposed to a waterfall, which seemed to be pretty typical of most of the waterfalls we had encountered in this loop drive. 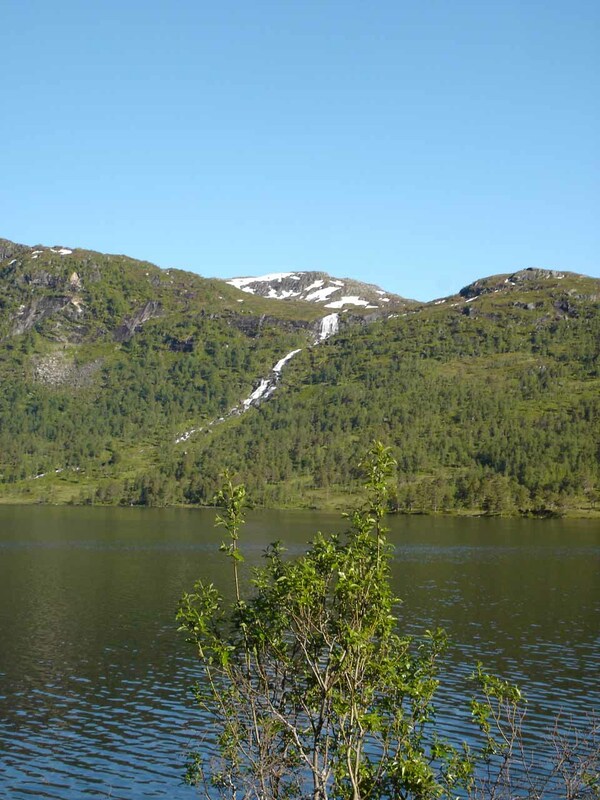 Beyond Vallestadfossen, we then briefly drove along the western shores of Haukedalsvatnet, but we veered away from the lake to continue driving northwest towards the lake Holsavatn. 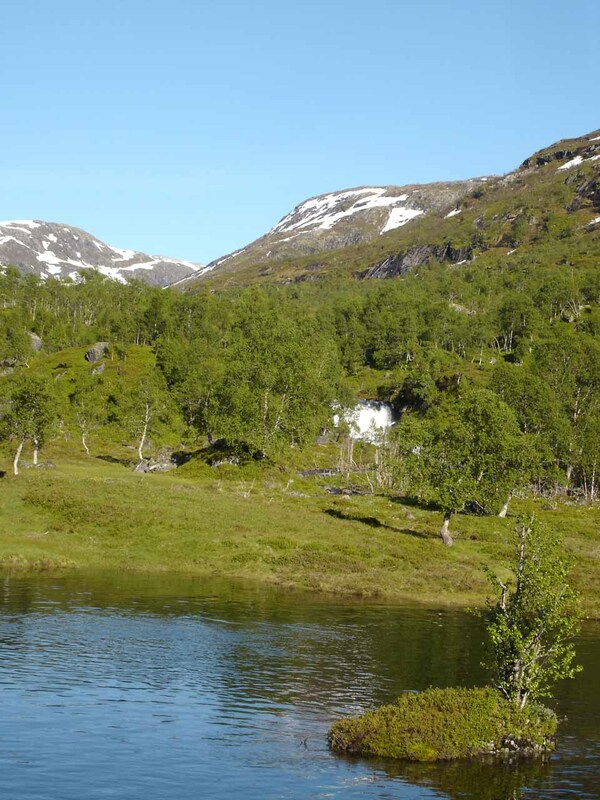 Had we continued following the northern shores of Haukedalsvatnet, we would have gone into the valley Haukedalen and ultimately encounter the waterfalls Garafossen, Kvernhusfossen, and Grønengstølsfossen. 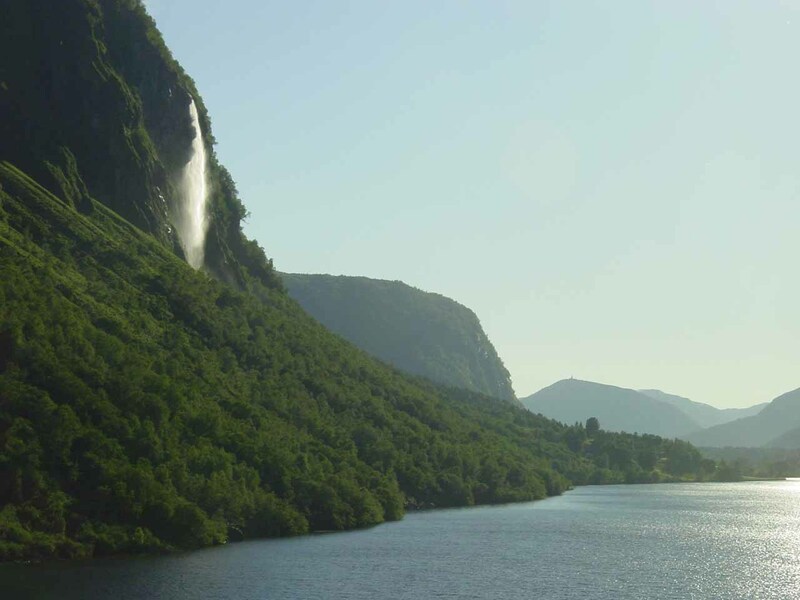 Nonetheless, as we drove around the eastern and northern shores of Holsavatnet, we saw an attractive waterfall plunging off the cliffs on the watercourse Driva. As we were looking against the late afternoon/early evening sun, the waterfall on Driva (I guess we can call it “Drivafossen” or “Holsafossen”) was lit up just right to make the waterfall have somewhat of a golden glow. It was really a lightflowing waterfall, but the effect of our perfect timing to chance upon this falls definitely left us with a lasting impression on this leg of the journey. 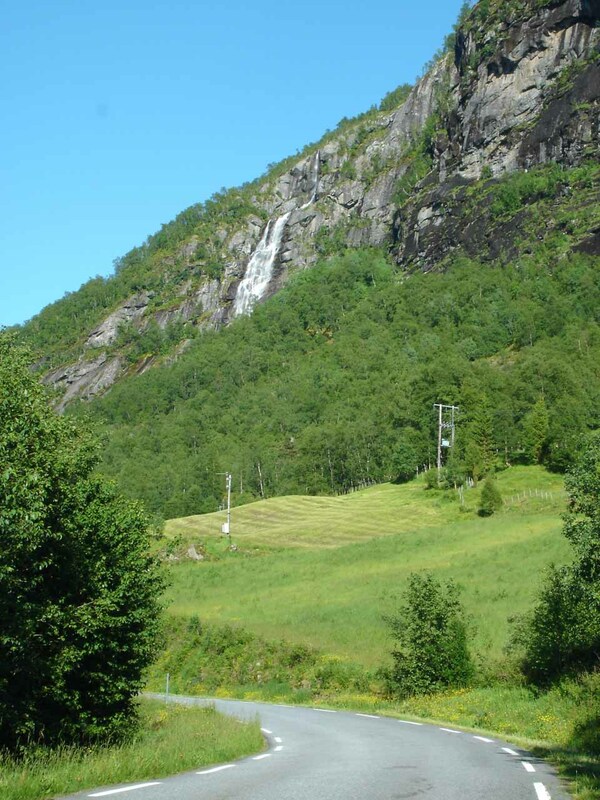 Eventually, our loop ended when we returned to the E39 near the Huldefossen waterfall by Moskog. 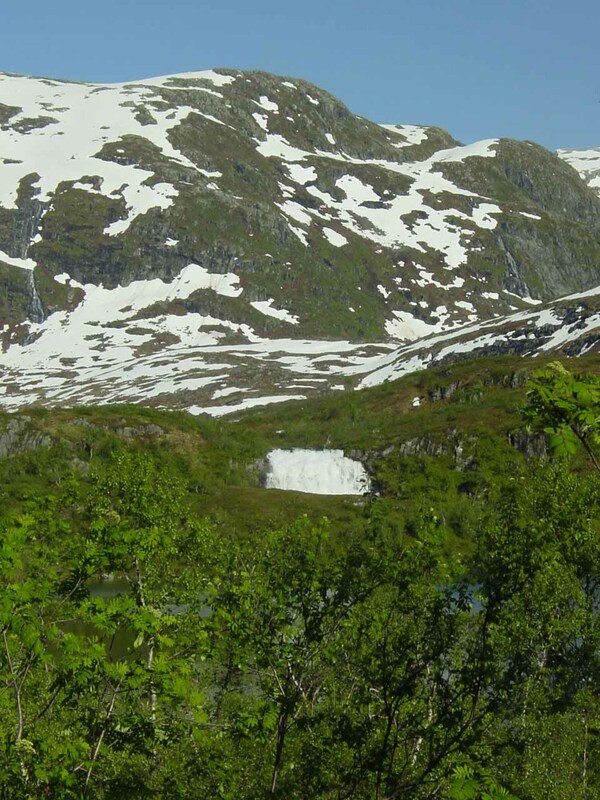 We have a separate write-up for that waterfall. 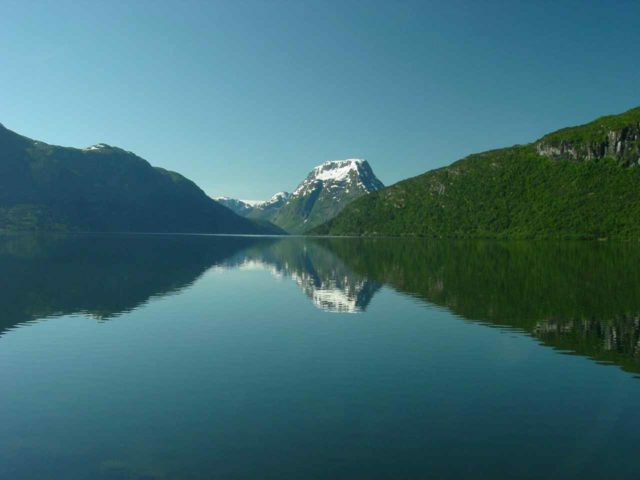 In the end, our loop tour ended back at the town of Førde. 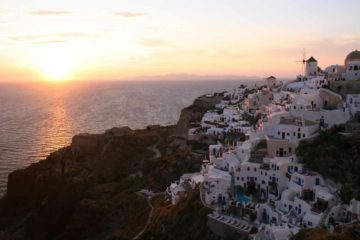 The total amount of time spent on this loop drive was about 5 hours, but we could have very easily taken even more time and do more walks (especially Fossestein, which was a full-day or multi-day excursion in and of itself). 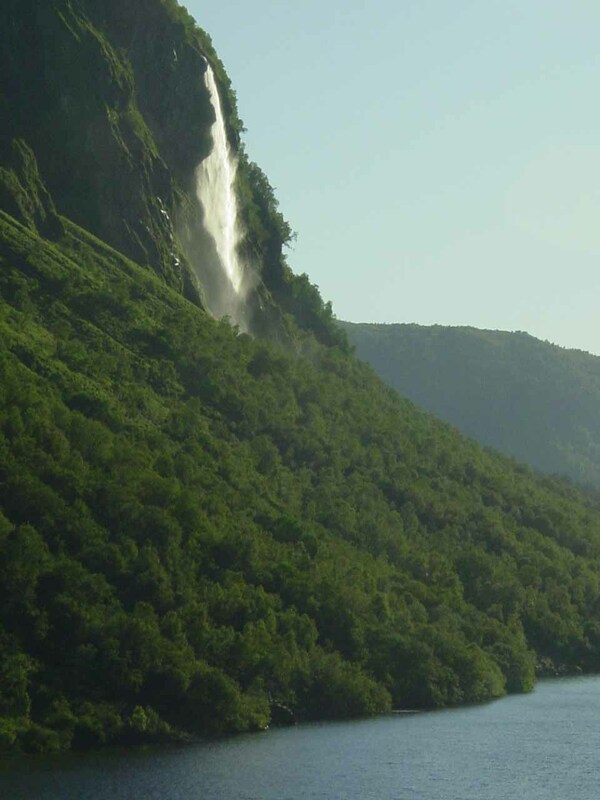 Most of the waterfalls on this page reside in the Gaular Municipality. For information or inquiries about the area as well as current conditions, visit their website or Facebook page. 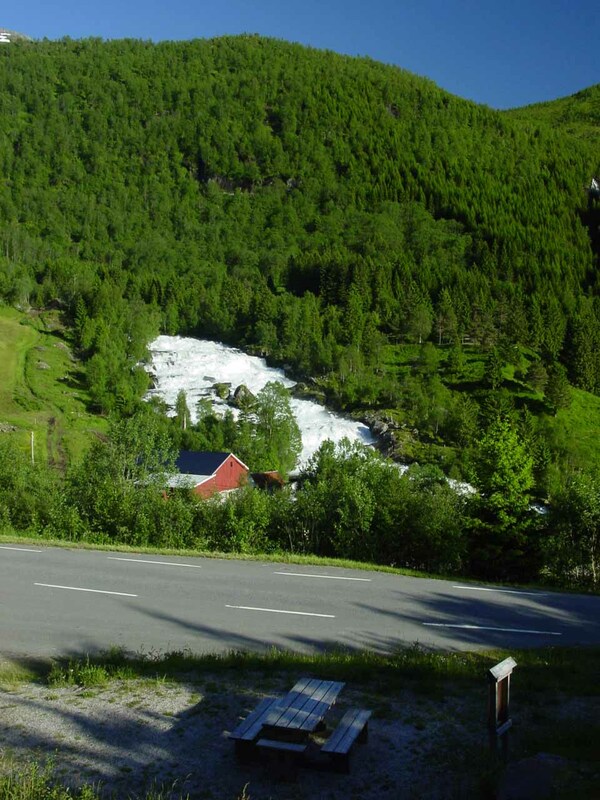 The Førde/Gaular Loop that was featured on this page started and ended at the town of Førde. For directions to the waterfalls Laukelandsfossen, Osfossen, and Huldrefossen, see those respective pages for details. 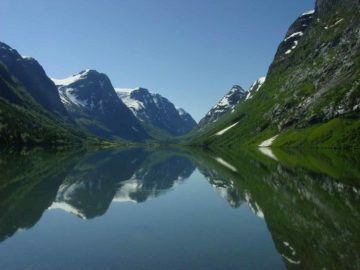 As for getting to the town of Førde, we managed to get there from the E39 due west of the town of Skei along the northern shores of the lake Jølstravatnet (about 44km between Skei and Førde). We then continued driving in a counterclockwise loop along the E39 heading south until the road ultimately intersected with the Route 610. 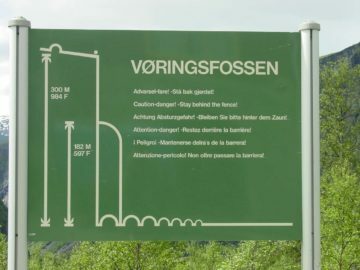 We then headed east on the Route 610 where we encountered the signed car park for Eikjelandsfossen about 6km from the E39/Route 610 junction. 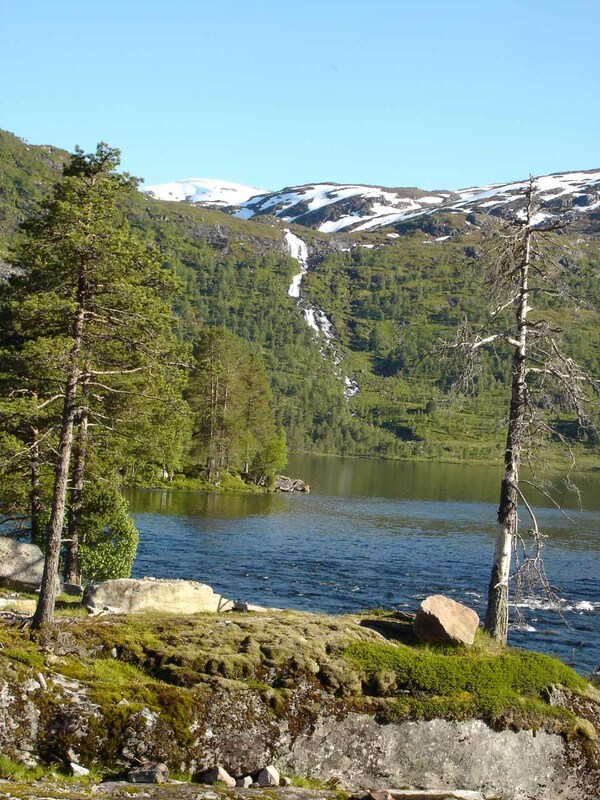 For the next 16km further to the east, we saw numerous unnamed waterfalls facing the southern shores of Vikdalsvatnet (or Viksvatnet). 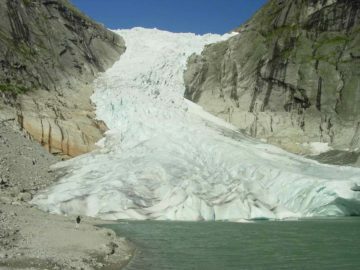 About 2km west of the Road 610/13 junction (on the Road 13), we saw Vikafossen. Meanwhile, we did an out-and-back detour for about 20km along the Road 13, which was alongside Fossestein. 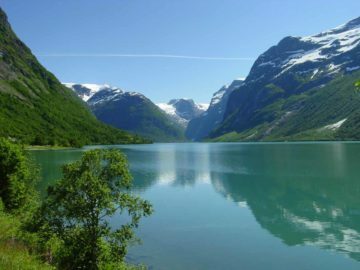 Back at the Route 13 by Vikafossen, Vallestadfossen was about 6km further to the east past the northern shore of Lauevatnet. 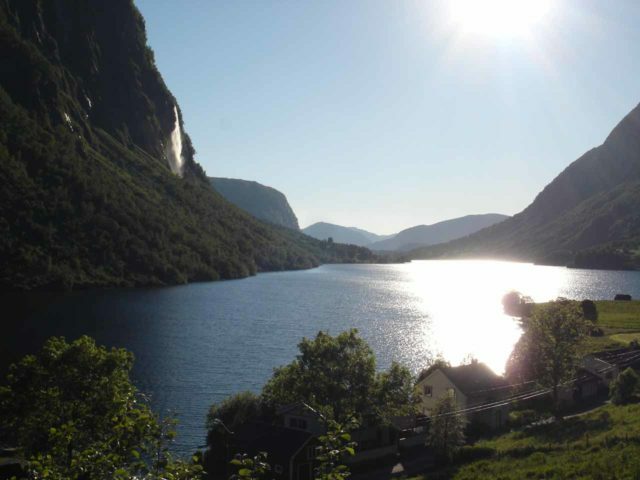 Then, we continued on the Road 610 for another 13km to the shores of the lake Holsavatnet where we saw the perfectly-lit “Drivafossen” over the lake. 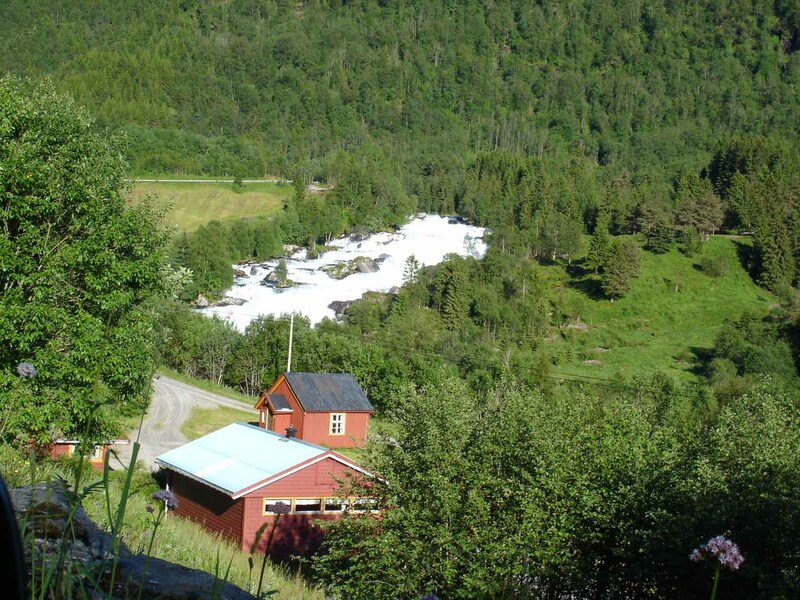 Our loop ended by the E39 another 9km west (just past the Stakaldefossen, which was regulated and we didn’t photograph. 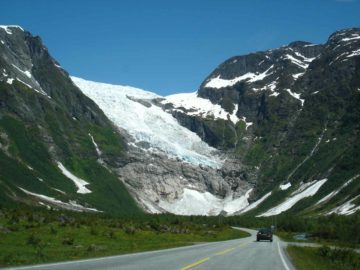 Førde was another 11km west of the Road 13/E39 junction by Huldefossen.